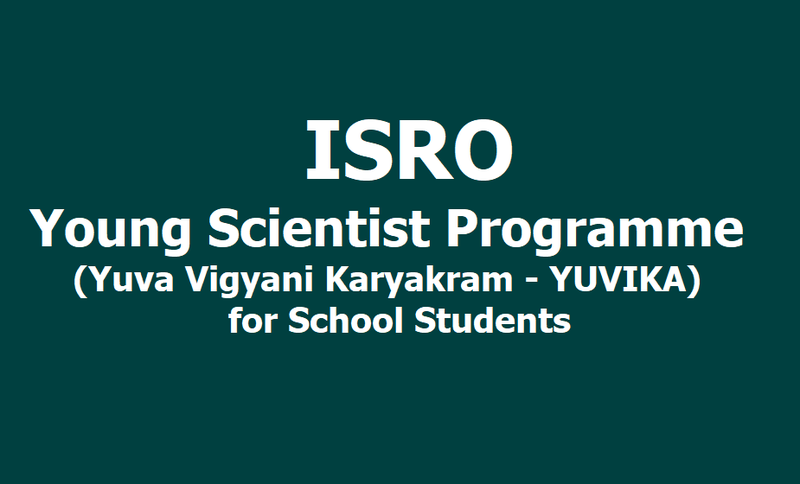 ISRO Young Scientist Programme (Yuva Vigyani Karyakram - YUVIKA) 2019 for School Students: ISRO is planning to conduct a special programme for school students called Young Scientist Programme (Yuva Vigyani KAryakram - YUVIKA ) from this year onwards. The Yuva Vigyani Karyakram Program is primarily aimed at imparting basic knowledge on space technology, space science and space applications to the younger ones with the intent of arousing their interest in the emerging areas of space activities. The YUVIKA program is thus aimed at creating awareness about the emerging trends in science and technology amongst the youngsters who are the future building blocks of our nation. This also expected to encourage more students to pursue in Science, Technology, Engineering and - Mathematics (STEM) based research/career. 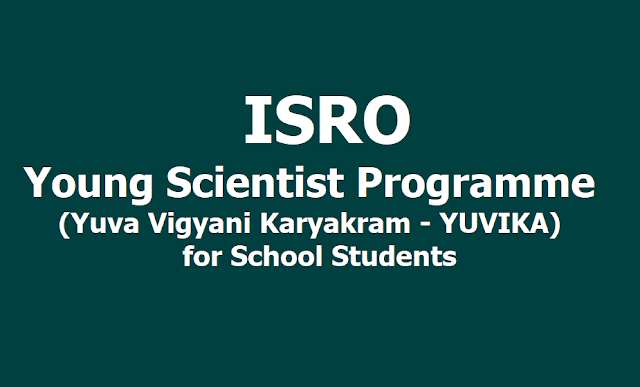 Subject: School Education - India Space Research Organisation (ISRO) -‘Conduct of a special program for School Students - Young Scientist Programme (Yuva Vigyani Karyakram -YUVIKA) - Regarding. While enclosing herewith a copy of letter in the reference read above, all the District Educational Officer in the State are requested necessary action for short list of applications for Young Scientist Programme (Yuva Vigyani Karyakram - YUVIKA) and send the same to the Director SCERT, Telangana, Hyderabad. The Director, SCERT, Telangana, Hyderabad is request to take necessary action for selection of students for Young Scientist Programme and furnish the selected candidate list to Chairman, Space Commission & Secretary, Department of Space. Bangalore under intimation to this office. This is in tune with the Government's vision “Jai Vigyan, Jai Anusandhan”. The Program is primarily aimed at imparting basic knowledge on space technology, space science and space applications to the younger ones with the intent of arousing their interest in the emerging areas of space activities. The program is thus aimed at creating awareness about the emerging trends in science and technology amongst the youngsters who are the future building blocks of our nation. This also expected to encourage more students to pursue in Science, Technology, Engineering and - Mathematics (STEM) based research/career. It is proposed to select 3 students from each State/ Union Territory to participate in this programme every year. Those who have finished 8th standard and currently studying in 9th standard will be eligible for the programme. The selection should be based on the following criteria. In case there is tie between the selected candidates, the younger candidates to be given priority. Expenditure: Expenditure towards the travel of student (II AC fare by train from nearest Rly Station to the reporting centre and back), course material, lodging and boarding etc., during the entire course will be borne by ISRO. II AC fare will be provided to one guardian/parent for drop and pick up from the reporting centre. In this regard, would be grateful if you could kindly arrange to select 3 candidates covering CBSE, ICSE and State syllabus stream from your State for the programme based on the above criteria. You may also identify a focal point from your state to interact with us further in this regard. Since the programme is planned from the coming summer holidays (April-May 2019), would request you to kindly do the needful to complete the selection procedure before March 2019 and inform us the list of selected candidates latest by 25th March, 2019. The focal point from ISRO in this regard would be Director, Capacity Building, Programme Office, ISRO HQ., dir.copo@isro.gov.in, Ph: 080 22172119/ 9496040045.